Integrating electric vehicles into the smart grid is an enormous and potentially explosive challenge. 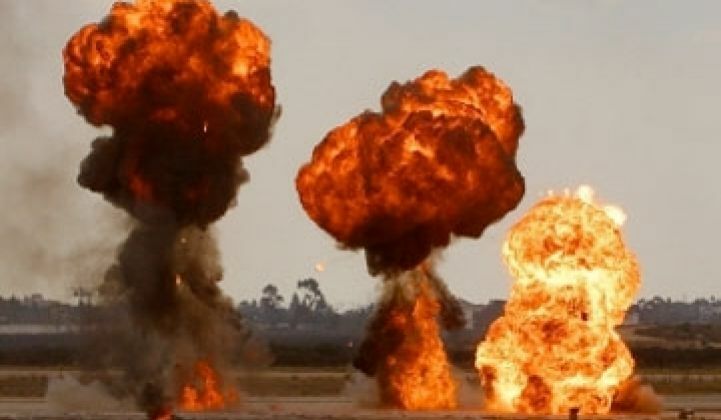 Erfan Ibrahim of EPRI has said that if electric vehicles reached a high level of market penetration and were to charge at night or in an unregulated way, it would look and sound like the Fourth of July from all of the utility transformers blowing up. These potential pyrotechnics and much more were covered in an event put on by Agrion LLC to address EV technology and vehicle-to-grid (V2G). 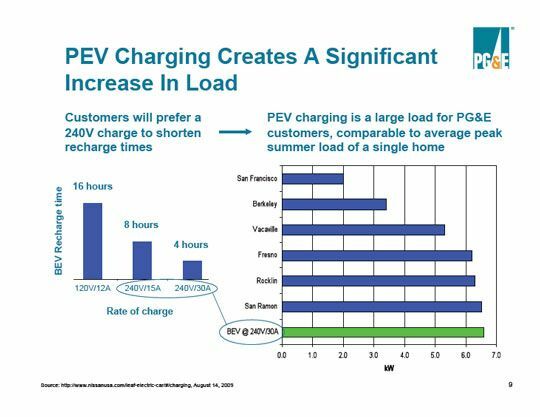 Vehicle-to-grid (V2G) describes an ecosystem in which electric vehicles or plug-in hybrids communicate with the power grid to leverage demand response services by sending electricity into the grid or by staging their charging rate in a process called demand dispatch or smart charging. Conspicuously absent from the panel at this event was a representative from a utility. This allowed the technologists on the panel from Better Place, Coulomb, Gridpoint and AC Propulsion to run wild without confronting utilities' reality. All this despite the fact that the utilities I've spoken with see V2G as being about twenty years away. Andrew Tang of PG&E has pointed out that charging a PHEV looks essentially like another home to the utility. Another home that happens to be drawing five kilowatts in the middle of the night. So how do you get utilities and EVs and the grid to play nice? One idea raised by Brett Williams of UC Berkeley's Transportation Sustainability Research Center entails tracking and treating electrons for "fuel services" differently than electricity for powering other stuff. Electric utilities in California are "de-coupled" -- i.e., not incentivized by how much electricity they sell. What if they were "coupled" on the electricity they sold for fuel services or if e-fuel was treated differently? The utilities would have a stake in the penetration and performance of EVs and V2G. Williams of the TSRC suggested that this might make sense because in the near-term there will be a need to track these EV electrons for carbon credits or so a tax can be applied to make up for lost revenue from gasoline road taxes. This plan is interesting, but, like any new energy idea, it is fraught with regulatory and societal issues. The utilities can't exactly consider these tens or hundred of thousands of vehicle batteries as part of their rate base. And there is the issue of the regressive nature of taxing the rate base to enable the production of $100,000 Tesla sport cars. A summary of the TSRC's work can be found here and includes the CEFIS project, which examines how the first costs of vehicles could be lowered for consumers and studies the secondary use of batteries. CEFIS was funded by the California Energy Commission and looks at a second life for batteries by adding storage to the smart grid in utility or consumer applications -- i.e., increasing the value of the battery once it's out of the car. And here's another good question: What happens to the vehicle manufacturer's warranty? Since batteries will be warrantied in miles, wouldn't using the battery for V2G void the warranty?"